Legends said that Bodhidharma pass across the river in similar way . 到了Lake George，首先就是先找營地，幸運地找到一個便宜的營地 (不過也要約USD 30)，不過設備倒是相當不錯，乾淨的廁所和洗到會燙人的浴室是我相當滿意的地方，到底有多好呢?! 讓我舉個例吧! 露營後隔天，就跑到Lake George去Kayaking，重點是我這次大膽嘗試了我哈很久的SUP (Standing Paddling Board )，超刺激的，控制上也不難，只是要克服一點心理障礙! 不過划在湖上，真是帥呆了! It was my second visit to Albany due to Joyce's invitation to a grass concert , thereby purifying my dirty flesh and soul . I made up my plan to camp at Lake george , north of Albany , after the concert since I would make such a long drive from Hartford . However, I left behind my camera when attending the concert ,probabaly becasue I was so excited to accept a purification of my flesh and soul .Anyway, pictures itself can't take the music down . The following is the first-hand narrative of the concert . 1. Amazing Music ! But I am not up enough to appreciate it. 2. Wonderful Ballet ! But I am too low to admire it . However, the No.1 principle of attending concert : must applaud when others do , otherwise you would be regarded as uncultivated . Next day , Let's go camping at Lake George ! Camping is the very common and popular American way . Here you can often see cars coming with a camping trailer during summer time . The first thing to do when arriving at Lake George is to find out a sutiable campsite. Fortunely , I got a cheap one very soon. Although cheap , it comes with excellent facility and infrastructure , particularly its clean and well-equipped bathroom . How good is it ? Listen to me ! When I looked around the bathroom , there was suddenly a piece of female voice coming from one of the shower rooms . Subsequently , the voice beated regularly . I , the one who stayed in university dorm for several years, realized what's happening right away ........See ! it is a good place ! 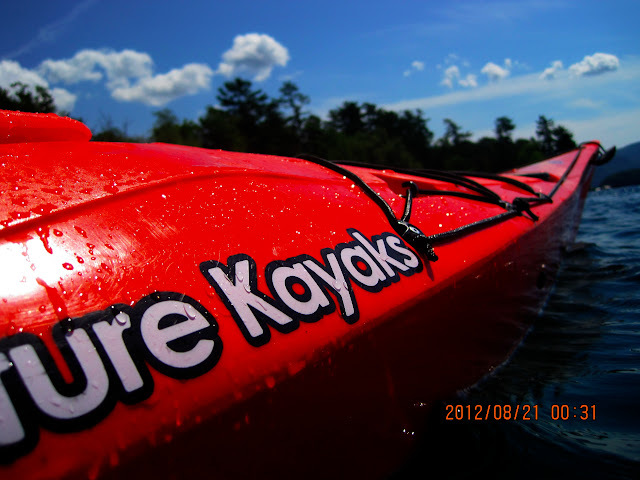 Kayaking is the main thing I planned to do at Lake George . 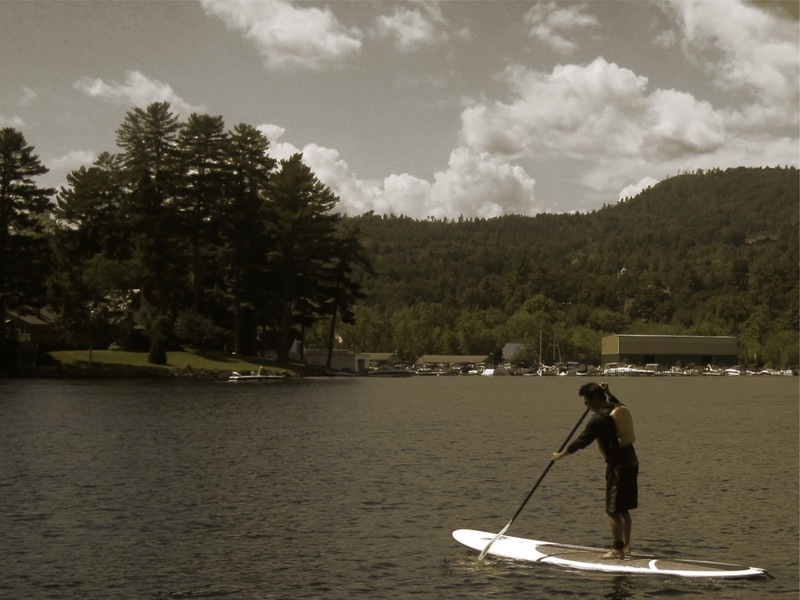 In addition to Kayaking , I even tried a new stuff --SUP ( Standing Paddling Board) , which I have been dying for long time ! It was definitely an awesome experience ! It is not chellanging , just calling for more counterbalance ability . I felt so excited , especially for such an unable swimmer as me.... Terrific ! Just a part of Lake George . It is more of sea than lake, in my opinion . American Size ! Even cruise can be done here . But, I don't think it is funny . There is even a swindler by checking people's palm ....?? A great meal ! But I am attractive to its home-made beer. Gary-- the cleaner ! I invited him to drink in the evening , but he didn't show up . He looked at me , saying " One guy , one car , one tent , going through U.S. , I did that as well when I was young " Gary is also a wanderer . All my stuffs and my residence tonight . Start to set up. Luckily , it is a easy-setting tent . Eveything was being done within 15 mins. An excellent gaget, JetBoil ,enable me to boil water for my instant noodle . Surely , the price is..."excellent"
Obviously , you are supposed to need a looser blouse ..
Kayaking -- one of must-do at Lake George. It is my first time to do Kayaking by myself ! Nervous ! But, they kept telling me "take easy "
I thought the wave and current shuold be lighter at Lake . But , it is not because lots of boats rushed around ,waving the lake . The island at left side is my destination . The owner of this boat is very funny , when I nearly bumped into him by accident , loudly speaking to me" this boat is made in Taiwan , come from Taipei , Nice boat !" I don't know if he knows I happen to be the one coming from Taiwan . But , the boat made in Taiwan seems to be a thing worth being proud of . After kayaking , I begged for the chance of trying SUP , and they agreed ! Here is a series of pics illustraing how to control it . Not challenging ,to be honest , just calling for overcoming the psychological stress and more counterbalance ability . Great Day ! But, I am really nervous when Kayaking. 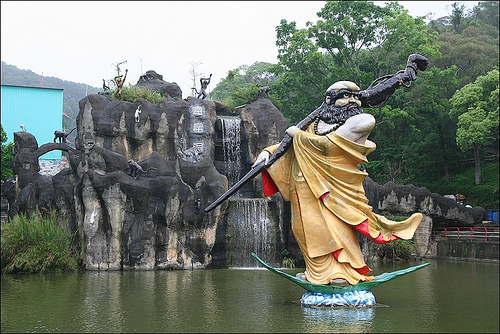 Iullstration on how Bodhidharma pass across the river .